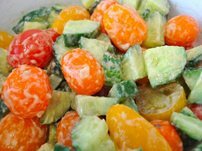 This is one of my favorite salads. 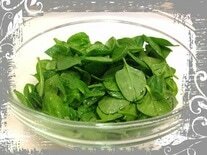 Organic Baby Spinach Leaves tossed in Flaxseed Oil and Mineral Salt. 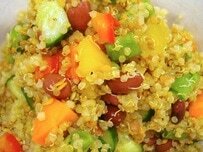 So simple, so good for you! ​Wishing You Love & Good Health! 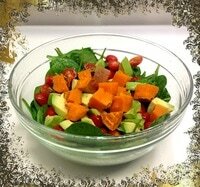 Sweet Potato, Avocado, Cherry Tomato, & Baby Spinach Leaves, tossed in Flaxseed Oil. Raw bowl of Beetroot, Red Cabbage, Yellow Cherry Tomatoes, Red & Yellow Bell Peppers, Chickpeas. Drizzle of organic cold pressed flax oil. Mineral salt to taste. Each of those beautiful colours are filled with nutritional goodness. For example: The rich red color of red cabbage reflects its high concentration of anthocyanin polyphenols, a protective phytonutrients. Health benefits and effects of anthocyanin pigments include antioxidants, anti-inflammatory, and their potentially protective, preventative, and therapeutic roles in a number of human diseases. Without sufficient intake of antioxidants, our oxygen metabolism can become compromised, and we can experience a metabolic problem called oxidative stress. Chronic oxidative stress—in and of itself—can be a risk factor for development of diseases including cancer. Red cabbage is full of vitamins and minerals, making it one of the most nutritious and best tasting vegetables around — a great addition to your healthy lifestyle. Drizzle of Cold Pressed Organic Unfiltered Flax Oil, & Mineral Salt to taste. 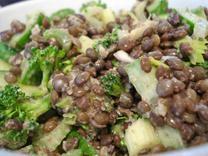 Drizzle of Organic Cold Pressed Flax Oil, & Mineral Salt to taste. 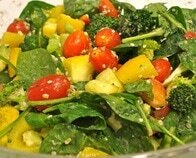 Kale with avocado, hemp seeds, and lemon juice dressing. - Beans, chickpeas, onions & turmeric. One of My Favorite Chinese dishes - Sauteed Broccoli with Shredded Ginger. 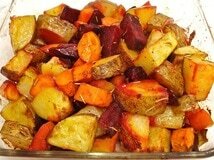 Ingredients Potatoes Beetroot Carrots Garlic Rosemary Extra virgin olive oil Mineral salt and pepper. Grease roasting pan with olive oil; Add all ingredients into pan; Pour olive oil over ingredients, mix and rub together; Can leave to stand for 30+ minutes, if you wish; Place in pre-heated oven at 210 C for 60 minutes; Stir ingredients at 30 minutes and again at 60 minutes. 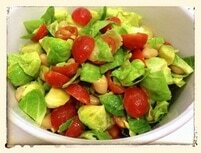 The avocado gives it that je ne sais quoi!